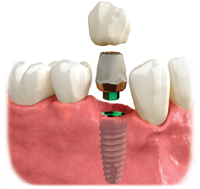 Dental implants are the new standard in missing tooth replacement. 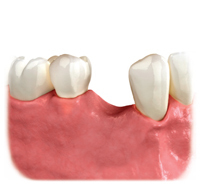 Missing teeth are replaced without altering the healthy adjacent teeth. A dental implant consists of a specially designed titanium rod which, once gently placed, bonds with healthy jaw bone to form a solid and permanent base to support one or more crowns or a denture. 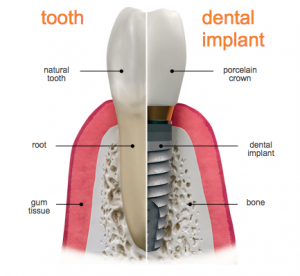 Dental implants look and feel like natural teeth, mimicking both the root and crown of a tooth. In addition to feeling and looking like your natural teeth, dental implants also act like natural teeth by stimulating jaw bone growth to prevent the bone loss which occurs over time when a missing tooth is not replaced. Opting for dental implants to replace missing teeth also means that, unlike other treatments, neighbouring healthy teeth are not compromised. What are the options to replace a missing tooth ? What does the implant treatment involve ? The implant, made of a specially designed titanium alloy, is carefully placed in the gap left by your missing tooth and left to fuse with the bone for a period of 4 to 6 months. This healing process is referred to as “osseointegration” and this implant replaces the root of the natural tooth. 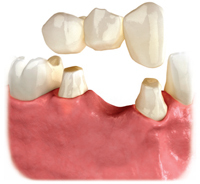 Sometimes a temporary bridge or denture is placed on the implant during the period of healing. Once we are satisfied that your implant has been fully integrated in the bone, a final crown is manufactured by a specialised dental laboratory to look exactly like a natural tooth. This crown is then secured to the implant to replace the missing tooth and restore full chewing ability. How long does the implant procedure take ? An implant appointment can vary depending on how many implants are placed but is typically around 2 hours. There is then a healing phase of 4 to 6 months. We will typically ask you to come in a couple of weeks after the implant placement procedure so we can check that the healing process is progressing as expected. There will then be a further short appointment to place the crown on the implant. Is having a dental implant painful ? The implant procedure is carried out under a local anaesthetic. The after effects are similar to having a tooth extracted so you may feel mild discomfort due to the normal healing process. However, this is easily managed by taking over the counter painkillers for 2 or 3 days after the implant procedure. Can everyone have a dental implant ? The suitability of a dental implant is primarily influenced by how much existing bone is available in the jaw to secure the implant. As part of your initial assessment appointment we will take an X-ray to determine the best treatment option for you. We will also ask you for your medical history to assess any contraindications or risks of reduced treatment effectiveness. In cases where there is insufficient jaw bone to properly secure your implant, we may be able to offer you bone grafting treatment in order to strengthen your natural jaw bone before placing an implant. In any case you can be safe in the knowledge that we will only ever recommend an implant if, based on the medical information you provided and the condition of your jaw bone observed via x-rays, we feel that the chances of success are high. How long will my implant last ? With proper care and maintenance, an implant, once placed and integrated with the bone, will last many years. The crown or denture placed on the implant may need to be adjusted or replaced after a period of time but is generally very long lasting. We work in partnership with Biohorizons®, one of the leading international suppliers of dental implants. The crowns we use for dental implants are supplied in the UK by a leading dental laboratory.